We offer supreme quality Spiral Memo Pads which are made of high grade paper material that elongates their utilitarian aspects. Our paper spiral pads have great efficiency and authenticity with resilient threads assuring their swift flip. Our firm is providing Memo Pads In Rigid Box. Due to high demand, we present this product in diverse colors and sizes that meet on market demands. Being the pioneers of producing writing pads, from business memo pads at the office to personal magnetic note pads for the fridge at home, this is the place to find the best note pad. - Padded to keep each and every sheet nice and neat. - Photo notepads featuring special images. 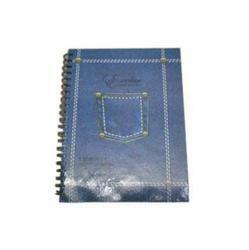 We are one of the trusted enterprises of Leather Items. To make these products, our experts use only industry approved leather that is bought from trustworthy merchants of market. Moreover, to sustain the quality, we also inspect these products at industry norms. Our products are available in the market at low prices. Our competency lies in offering our clients an excellent quality range of Memo Pad. We are engaged in supplying, exporting a comprehensive array of high quality Memo Pads. We produce memo pads in various specifications catering to the demands of the market across the globe. We provide with customization facility for our customers. We provide memo pads in every shape and size and also gives 3D product memo pads. A ideal desktop promotional gift which suits every budget.